Working within the parameters of a national art collection begs the question not just, ‘How did international developments in art impact nationally?’ but also ‘How did national developments impact internationally?’ Based in a geographically fixed location, with the resources, collections and libraries of one particular city, museum curators most often deal with the first question (it’s much easier to find the answers!) but during my Mobius fellowship in Finland, I attempted to focus on the second. I was based at the Ateneum, where the collections of the Finnish National Gallery dating from the earliest period to the mid-1960s are displayed (after which they are displayed at Kiasma). In this article I outline some of the themes and ideas my research addressed by focusing on a concise selection of four documents and objects I encountered. Barbara Hepworth, *Photograph of ‘Sculpture with Colour (Deep Blue and Red)’,* c.1940. Photograph © Bowness. One image that serves to illustrate why I wanted to undertake this research in the first place is one I came across as a result of working on an exhibition of work by the British sculptor, Barbara Hepworth, which was held at Tate Britain from June to October 2015. 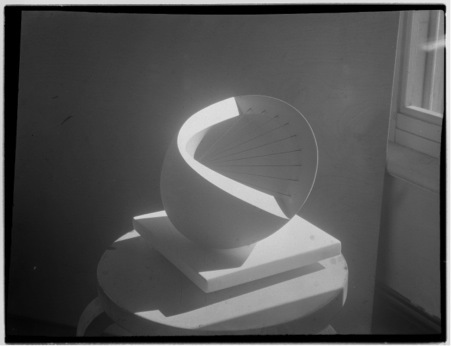 The photograph is one of several taken by Hepworth herself, who used a camera to document her sculptures over an eleven year period from 1933 to 1944. The work depicted is one of a series made c. 1939-43 – first in plaster and then in wood. To the inner part of the sculpture Hepworth applied blue paint and the strings were coloured red. The works mark a point of transition in Hepworth’s oeuvre, representing the sculptor’s early use of colour, and of string, evoking the mathematical models that she and other artists working in London in the 1930s (such as Naum Gabo and Henry Moore) became interested in. The photograph was taken at Dunlace, Hepworth’s house in Carbis Bay, near St. Ives in Cornwall, using natural daylight to light the piece. The make-shift ‘plinth’ is, unmistakeably, one of the signature pieces of the famous Finnish designer and architect, Alvar Aalto. The photograph therefore functions as something of a visual document, testifying to the exchange that occurred between artists, architects and designers internationally in the early twentieth century. Aalto’s work had previously been included in a book edited by Ben Nicholson, Naum Gabo and Leslie Martin with assistance from Hepworth in 1937. The book, Circle: International Survey of Constructive Art, included a selection of artworks, designs and buildings by prominent international figures alongside essays which set out the principles of the ‘Modern Movement’ to which they belonged. This publication followed Aalto’s successful exhibition at Simpson’s of Piccadilly in 1934 in London, which brought his work recognition amongst a wider public in Britain. In nationally defined histories of art, the significance of these broader links and influences can become lost, and so the photograph was, in essence, the provocation for my research. Paul Cézanne, *The Road Bridge at L'Estaque; The Viaduct near L'Estaque,* 1879-1882. Collection of the Finnish National Gallery. Photograph © Finnish National Gallery / Matti Janas. This work, now in the collection of the Finnish National Gallery, was included among those shown at the notorious Manet and the Post-Impressionsts exhibition at the Grafton Galleries in London from 8 November 1910 to 11 January 1911. 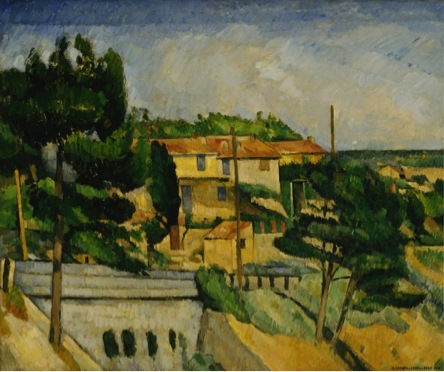 Organised by Roger Fry, Desmond MacCarthy, Clive Bell and Ottoline Morrell, this exhibition was the first to bring works by the likes of Cézanne, Manet, Gauguin, van Gogh, Picasso, Seurat and Matisse to the attention of the British public and critics, who hadn’t seen such modern works before and were, on the whole, shocked by the styles and subject matter on display. Research into correspondence held in the archive of the Finnish National Gallery showed how the acquisition of this work was mediated by the British artist and critic, Roger Fry, a friend of the London-based Finnish art historian Tancred Borenius. Letters from Borenius to the Finnish art historian Yrjö Hirn, reveal Fry’s role in the acquisition, describing how Fry identified suitable works for purchase, negotiated the selling price with Cézanne’s dealer and how he committed to write an article about the work for the Burlington Magazine. For those involved in expanding the Finnish national collection of art in the early years of the twentieth century, who were keen to engage with international artists and ideas and encourage the development of the arts in Finland as a consequence, the guidance and advice of figures such as Fry were invaluable. Borenius’s friendship with Fry resulted in this key modern acquisition for the Finnish national collection, and as I continued my research I found evidence of continued influence of various British critics and art historians from institutions such as the British Council, the Tate Gallery and the National Gallery on the development of art in Finland in the modern period – influence that was perhaps of greater significance than that of any particular British artists. In 1939, the first exhibition staged by the British Council of modern British art was held in Finland – at the Helsinki Art Hall. It comprised two hundred and thirty works, a large proportion of which were watercolours and prints. The works were loaned from artists, dealers and from public and private collections, and several were subsequently purchased for the Finnish National Collection. A key figure in Finland, who was especially instrumental in the staging of exhibitions of art from abroad including the 1939 exhibition was Bertel Hintze. The Finnish National Gallery archive holds the papers of Hintze, and among them are letters to a number of British correspondents which show how important individual figures are in facilitating international exchange. Hintze had previously staged exhibitions of French and Russian art in Helsinki in the 1920s, and his 1930 book on modern art (Modern Konst: 1900-talet, Mercators Tryckeri Aktibolag, 1930) is indebted to a number of British critics, including Clive Bell, Roger Fry, C.J. Holmes, Jan Gordon and Frank Rutter. He was a co-founder of the Contemporary Art Association in Helsinki (Nykytaide ry) and became friends with the secretary of the Fine Arts Committee at the British Council, Major Alfred Appleby Longden, with whom he organised the 1939 exhibition of British art. While these personal relationships clearly facilitated greater contact between the two nations, they also inevitably result in a degree of bias with regards to the type of artworks that were discussed, loaned or purchased. For instance, the 1939 exhibition did not include examples of works by the most prominent non-figurative or ‘abstract’ artists in Britain at the time such as Ben Nicholson or Barbara Hepworth. 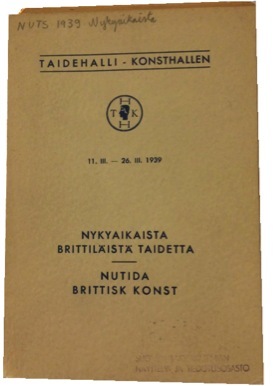 Nevertheless, as relations between the two countries resumed after the Second World War, new voices such as the Finnish art historian Eila Pajastie, who studied at the Courtauld Institute of Art in London and reviewed London exhibitions for the Helsinki journal TAIDE, helped a more diverse picture of the arts in Britain emerge internationally. View of Henry Moore’s *Reclining Figure on Pedestal* 1959-60 at the Didrichsen Art Museum, Helsinki. Photograph © the author. The mutual interest of artists in the work of architects and vice-versa led to increased international collaboration during the modern period, something hoped for in the 1930s, but really only made possible in the post-war era, a period of large-scale government-funded building projects in Europe and elsewhere. 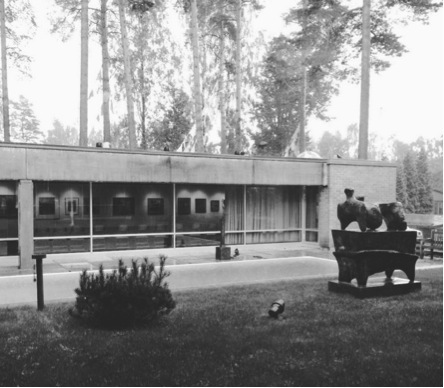 Finnish architects working abroad encouraged these connections and one example is Viljo Revell, who had visited Moore in England and introduced his work to the collectors Gunnar and Marie-Louise Didrichsen (whose home in Helsinki Revell had designed). The Didrichsens purchased a number of pieces by Moore for their collection of international modern art, and their house – now the Didrichsen Art Museum – and collection is emblematic of the change that occurred over the first half of the twentieth century in understanding British art – whereby it ceased to be understood solely in terms of a national narrative, and instead became more intertwined with the international contemporary art market in the West. The research undertaken during the Mobius fellowship was facilitated by the staff and resources of the Finnish National Gallery, to whom I am very grateful. An extended paper discussing the results of my archival research in more detail is pending publication. Inga Fraser is Assistant Curator of Modern British Art at Tate. She is currently assisting Emma Chambers on a Paul Nash retrospective exhibition, opening in October 2016. Previous exhibitions and displays include Barbara Hepworth: Sculpture for a Modern World (with Chris Stephens and Penelope Curtis), Marlow Moss (with Dr. Lucy Howarth) and Spaces of Black Modernism, London 1919-1939 (with Gemma Romain and Caroline Bressey). Inga was previously Assistant Curator of Modern and Contemporary Art at the National Portrait Gallery, London; Associate Curator of Fashion in Film; and Research Fellow in Fashion History and Theory at Central Saint Martins College of Art and Design. Her research focuses on the impact of the emerging disciplines of photography and film on artistic development in the 20th century, and the convergences between art, fashion and design under modernism. Recent publications include ‘Media and Movement: Barbara Hepworth Beyond the Lens’ in Barbara Hepworth: Sculpture for a Modern World (ed. Chris Stephens & Penelope Curtis, Tate, 2015), 'Born Fully Clothed: the Significance of Costume for the Silent Cinema Vamp’ in Birds of Paradise: Costume as Cinematic Spectacle (ed. Marketa Uhlirova, Koenig, 2014), ‘Body, Room, Photograph: Negotiating identity in the self-portraits of Lady Ottoline Morrell’ in Biography, Identity and the Modern Interior (ed. Penny Sparke and Anne Massey, Ashgate, 2013) and ‘Iris Tree’ in Oxford Dictionary of National Biography (Oxford University Press, 2014).